No matter how popular beards are, there are still some of you that really don’t like the full beard, yeard or tweard look. You need a beard trimmer to keep that facial hair on point. They can be expensive and some of them just don’t work well. The Remington beard trimmers could be the answer you’re looking for. Overtaken in the past by other brands, Remington often gets overlooked. Lately, they are making a comeback by making some top-notch beard trimmers while still keeping the price within reach of just about anybody. In this article, I will go over their line of Remington beard trimmers and Remington electric razors highlighting the ones I think work best. Before the reviews, you can take a look at a comparison table to see how they rank at a glance. Great for guys with longer than stubble beards but not too long. This is a corded model. Guys with sensitive skin. Pretrim feature prevents irritation. Wet operation since it has a brush attachment for wet shaves. Remington beard trimmers run the gamut from stubble trimmers to beard trimmers. All beard trimmers can potentially be stubble trimmers, but not all stubble trimmers can be beard trimmers. You can set your beard trimmer to go right down to the skin or they can just take the ends off the beard if it is set to the longest length. A stubble trimmer can’t really be set to a length that does any kind of trimming. It’s really a shaver that leaves enough stubble to look like a beard. At the longest setting, you may be able to leave your beard at around ¼ of an inch. Before you decide on which Remington beard trimmer will work best for you, you have to determine what you want to do with your beard. Both stubble and beard trimmers will have seel blades that can be used without guards to shave right down to the skin. To leave some length, you can use a plastic comb attachment covers the trimmer blade and leaves your beard a consistent length all around. 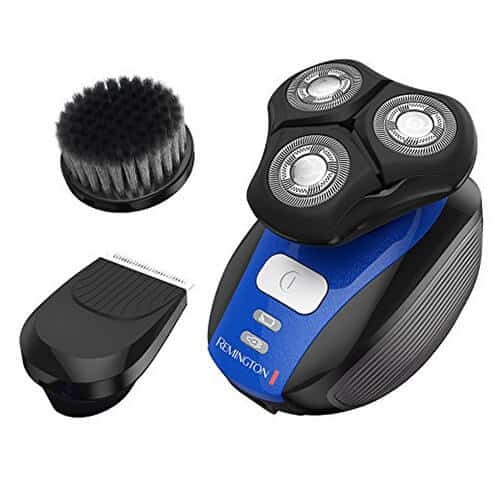 There are two different kinds of these attachments with Remington beard trimmers. One is a simple comb-like one that pops right on and leaves a set length. Remington makes their combs with a hard plastic with almost no give to them. This is good as it makes sure that the beard is truly even. Attachments that bed a bit will leave shorter spots all over the beard. If you want a taper or just some areas of the beard shorter, you swap out the comb for another of a different length. Then there are the more convenient dial systems that can change the length without needing to change the guard. Also made out of hard, durable plastic, they have a system whereby turning a dial, the length of the guard can be changed. You can get far more accurate trims when you want a tapered beard or varying lengths since you aren’t boxed in by a set length. There might not seem like a big difference between ⅜ inch and ½ inch, but there is some room there to play with if you can set the combs between that. Compared to the Phillips Oneblade, it is a multipurpose trimmer that can trim your beard down, edge it and shave the skin around your beard. It does a lot of things the OneBlade does, but for a lower price. This is the main advantage of using Remington beard trimmers. Before you go ahead and buy this trimmer, understand that it is a stubble trimmer. This is not meant to be a beard trimmer for long beards. The four clip on guards will leave your beard from 1mm up to 6mm at the longest. If you like keeping your beard tight, then this is definitely what you’re looking for. Then there is the fact that you can take the guard off and edge your beard due to the unique design of the blade edge. With a safety guard on the top and the bottom of the blade, you can use this edge to line up your beard. To really define your beard, you can then use the full face of the blade as an electric razor to shave down to just about skin level. One thing to note is that this is not like a foil electric razor that gets as close to the skin as a razor. This is good for guys with sensitive skin that prefer to leave an ever so slight stubble rather than a close shave. It is enough to give your beard some shape and good definition. The blades never need to be replaced and can potentially last years. To make sure they stay sharp, make sure you are brushing any hair off of the blade and keep it in a dry place. The battery can give you a full hour before it needs to be recharged. Thanks to the USB cable charger, this works great as a travel beard trimmer since it can then be charged wherever you go. This is advertised as a wet/dry beard trimmer, but honestly, it does not perform well if you use it in the shower as a trimmer. Rather, it can be used wet with shaving cream for the shaved areas of your face or rinsed under the faucet to clean it without it getting damaged. This is a very good budget option for guys looking for the best stubble trimmer. It can handle a lot of different jobs and gives you some good versatility. You get a lot of versatility with this Remington beard trimmer. It is really a whole body groomer, but in this review, I will stick to how it works as a beard and stubble trimmer. Let’s start with what comes with the beard trimmer. A T-blade is the star of the show as it is the main blade. Use it to edge your beard when it is used without any guards, or shave the beard right down to minimal stubble. It’s heavy duty and can handle most beards no matter how thick or wiry. Or, pop on one of the plastic guard attachments. Five beard and stubble combs will trim your beard down to 1.5 mm up to 12mm. There is also the very convenient dial system precision metal comb attachment. This is what really makes this the ideal beard stubble trimmer. Made of solid metal instead of plastic, it pops on over the blades and can be dialed in for lengths from 1mm to 5mm. If you like having a tapered beard, this can do that in a snap since it is accurate and doesn’t need to be swapped out for another comb until you go over 5mm. Once you have your beard trimmed down to your preferred length and have shaped it with the edgers, you can then pop on the foil shaver attachment and shave the rest of your face. With 5 full hours on a charge, no other cordless comes close. During those five hours, you can use the Beard Boss in the shower or dry, with shaving cream for the razor or without. Since they are self sharpening, the blades never go dull. Even the toughest beards will get cut down with ease. The price is slightly higher than what you would expect from a Remington beard trimmer, but it is justified. 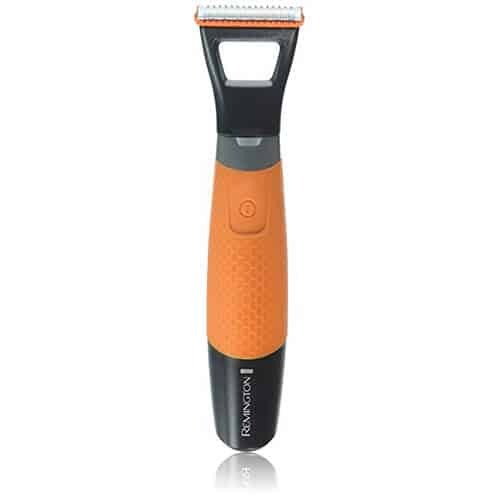 There is just so much this trimmer can do and the long runtime sets it apart from its peers. If you need a trimmer that does it all, then this is definitely worth a few extra dollars. When you have a longer beard, having a tool that does a lot of the work without breaking the bank is very much appreciated. The Beardsman Remington beard trimmer is just the ticket for taking care of the soup to nuts of beard grooming. With a 35mm comb attachment, roughly equivalent to 1.5 inches, you can leave your beard on the longer side and guarantee an evenly trimmed beard. 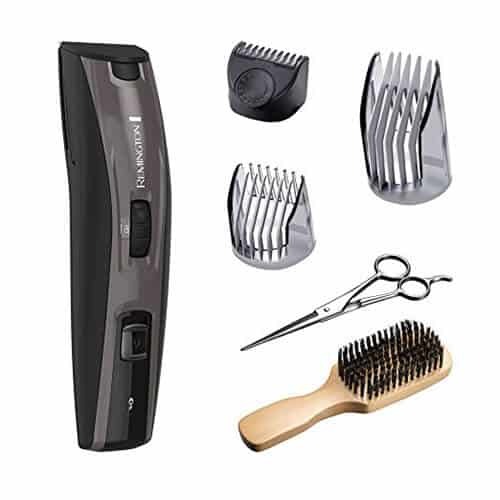 If you want it shorter than that but longer than the next comb size down, there is a dial on the body of the trimmer that can set the blades in incrementally lower lengths to really zero in on the best length. This also makes tapering a beard very easy to do. I am honestly surprised that there are not more beard trimmers with this feature. Now that beard styling at home is becoming more popular, maybe we will see this trend in trimmers. The lowest setting comb attachment will leave your beard stubble if you decide to go that route. And this even has a dial system on it to set it at a precise length. The blades are super sharp and will stay sharp for quite a while. This is great for edging your beard precisely. Especially with the pop-up edger to take care of the cheeks. It might not be strong enough to edge your entire beard if you are doing a chinstrap or something as an example, however. A two hour runtime gives you plenty of time to do some real precision work without ever running out of battery. To really make sure you have everything you need to trim your beard, there are scissors and a beard brush included. 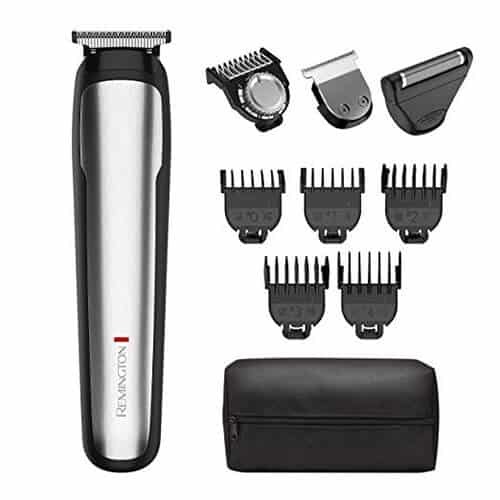 You can really take care of the entire beard grooming process with this set of trimmers. When you consider the price tag, it is very surprising to get the kind of precision that you get from the Beardsman. It may not be the most solid feeling trimmers compared to Wahl or Andis professional ones, but to be able to take your beard grooming into your own hands, it does it all. Electric razors come in two different types. Foil or rotary. Remington electric razors are no exception and come in both versions. These electric razors have very sharp blades that rock back and forth very quickly. So quickly that they make a distinct buzzing sound. Over these blades is a foil sheet with either holes, or slits cut into it. Your beard hair ends up in one of the holes and the blade beneath it chops it off. Since the distance between the blade and the foil is hardly anything at all, you can still end up cutting the hair right down to the skin resulting in a shave that can be as close as a regular razor. The way these cut is much the same as the foil in a way. Instead of foil, there are circular bands of metal that have slits cut out of them where the hair will enter. Underneath are the blades. In this case, they rotate rather than rock back and forth. There are generally three sets of these blades and they are on a pivot head. The operation of a rotary razor is much quieter than a foil one since the blades rotate around instead of going back and forth. It depends on a few factors as it isn’t a one size fits all approach. There are pros and cons to both depending on your features and needs. When a foil razor is better. When a rotary razor is better. 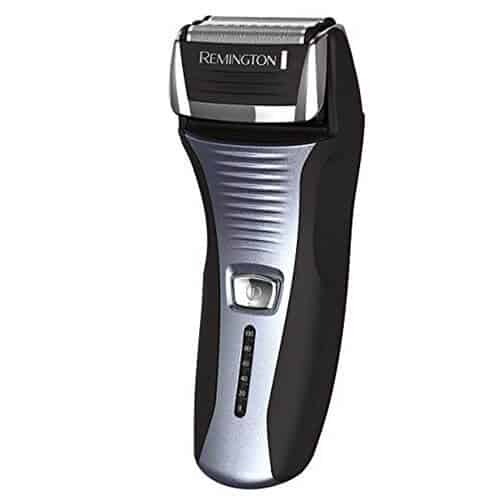 For these reviews, I will pick the best foil Remington electric razor and the best rotary one. Remington is making a big comeback into the electric razor world with the F5-5800 foil razor. It is something that can compete with the Norelco and Braun and at a much lower price. One of the downsides of electric razors, foil or rotary, is that you end up having to going over the same spot a few times to get all the hair trimmed. This can lead to irritation of the skin. By using a pre trim feature, it can start trimming the hair so it is far more efficient. It uses a sort of guard that sits between the foil heads that lifts up the hair and trims them shorter to make it easier for the blades under the foil to cut. This gives a very smooth shave that takes less time and causes less irritation. A pivot head is great at getting under the jaw line and around the chin. Spots that typical foil razors struggled with. Two hour shave time means you can get a few weeks of shaves before it needs to be charged again. And if you somehow forget to charge it, you’re in luck as it can be used with the cord, too. This is not likely to happen to begin with because there is an LED battery life screen letting you know how much juice is left. A pop up trimmer on the side will allow you to edge your sideburns. It isn’t super sharp, however, it should be noted. As long as your burns aren’t too long you should be fine. For the price, this Remington electric razor simply can’t be beat. It is very comfortable to use. It gives a very smooth shave. And it doesn’t leave your skin irritated. In a head to head comparison with the other big players in the field, it only shows its budget price in the weight of it. It simply doesn’t feel as solid as the others like Braun or Philips. The results are in the same ballpark, though. And that is what you are paying for. As a barber, I am always trying to get people to understand that the most important part of a shave is prepping the face. Finally there is an electric razor that understands this. To properly lift the hairs of your beard and soften the skin, there is a brush attachment. Put some good shaving cream on your face and then use the brush to gently rotate and get that water into your skin and the hairs ready to be shaved. Doing this before your shave will give you dramatic results. Of course, you don’t need to use it with shaving cream. It is very effective even when using it dry. If you have sensitive skin, though, taking the few extra minutes to apply shaving cream will help you out there. It is so ergonomic and fits so easily in the hand that it also makes the whole process go easier. In fact, the shape and size make it ideal as a head shaver. A rubberized grip makes it slip proof even when using it in the shower. Even if you opt to not use the shaving cream, then shaving in the shower will make a big difference. When the skin and beard are hydrated, it makes it much easier to shave closely. And you save a few minutes out of your morning grooming by killing two birds with one stone. The way the heads are made, it allows for a lot of the hair shaft to get collected and then shaved off by the blades. This is a very smooth and close shave. Even if you are beyond stubble, the hair can easily be knocked down by the guards. With a multi-directional pivoting head, you can get to those angular areas of your face, like right under your chin or jawline. It’s hard to believe that the price on this Remington electric razor is so far under $100. The quality of the build and the closeness of the shave should set the price much higher than it is. This is easily the best budget electric razor on the market. With so much versatility, ease of use and superior shave, it punches way above its class. If you have been searching for a cheap electric razor but have not been happy with the results of inferior products, then give the Verso a shot. Let’s not kid ourselves about one thing. Neither the Remington beard trimmer or electric razors are Ferraris. They are not premium gear. What they are, are fine products that perform much better than expected for the price that you pay. And in some cases, they can go head to head against the competition. One thing to remember with any product is to take care of them. Since they might not be built with the highest quality parts, you have to be extra careful to clean them and not let them stay in unfavorable conditions. There are complaints about the thinness of the foil on the electric razors, for example. If the hair is not cleaned off of them, the foil will deteriorate. This is a fact that affects any foil razors. Hair is acidic and ruins your equipment if it is left on the blades or other parts. Take care of your Remingtons and they will take care of you!